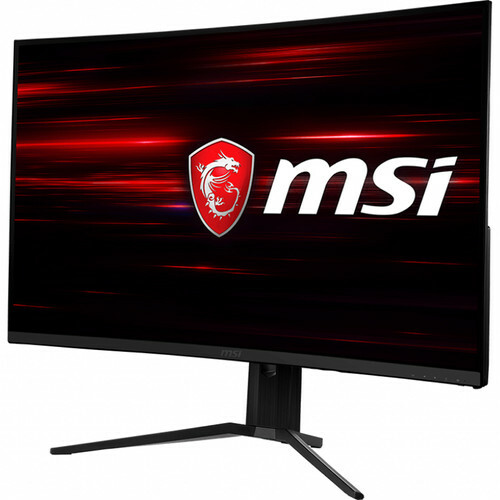 The 31.5" Optix MAG321CQR Curved 144 Hz FreeSync LCD Gaming Monitor from MSI features an 1800R curved VA panel, which places you in the middle of the action for an immersive viewing experience. Combined with wide 178° viewing angles, it offers crisp, clear, and vivid details wherever you're sitting. Specs-wise, it has a 2560 x 1440 WQHD resolution, a 300 cd/m² brightness rating, a 3000:1 static contrast ratio, and support for up to 16.7 million colors. Built for gamers, this monitor also supports AMD FreeSync and has a 144 Hz refresh rate with a 1 ms response time. Connect it to your system via HDMI or DisplayPort and adjust its versatile stand to best fit your viewing needs. Users can also install an optional VESA-compatible mount, stand, or arm if needed. AMD Radeon FreeSync technology syncs the display's refresh rate with your graphics card's frame rate output to reduce screen tearing, stuttering, and ghosting for a fluid gaming experience. A 144 Hz refresh rate combined with a 1 ms response time offers a smooth gaming experience when playing fast-paced genres such as FPS, fighters, racing sims, RTS, and sports. The downloadable Gaming OSD (On-Screen Display) is your dashboard for adjusting monitor settings and accessing additional functions such as application-optimized viewing modes and in-game overlays. The back of this monitor is equipped with customizable RGB LED lighting. Download the software to select a variety of lighting effects and millions of colors to best fit your ideal aesthetics. Anti-Flicker and Blue Light Reduction technologies help to reduce eyestrain and fatigue caused by extended viewing periods.